Blackboard Collaborate Ultra is a web conferencing tool. It’s not your ordinary video call tool. Participants can share their screen during the session, and discuss and ask questions in the comments. Also, individuals can speak one at a time and there is an option to ‘raise your hand’ to ask questions during the session. Your instructor decides how they will deliver the course content and which features to use. What’s the use of this for students? What would you need a web conferencing tool for as a student? Well, there are at least 3 important uses. There’s online classes, office hours, and group work. Online Classes: For those who have/ will have online classes, your instructor may choose to use Blackboard Collaborate Ultra. They are able to live stream their lectures for students to join and participate without being in the classroom. Your instructor can choose to record their lecture too. This allows students who weren’t able to attend the lecture to have access to the content. Office Hours: Some instructors and TA(s) may choose to use Blackboard Collaborate Ultra for their office hours. They can create a timed web conference, which allows you to join in at anytime during their scheduled office hours. Group Work: Within the web conference your instructor can divide you into groups. This gives you and your peers the ability to work together without the whole class and formulate group discussion about lecture content. Long distance charges may apply if you are joining the webinar using a telephone. The teleconferencing number provided by Blackboard Collaborate Ultra is not toll free. 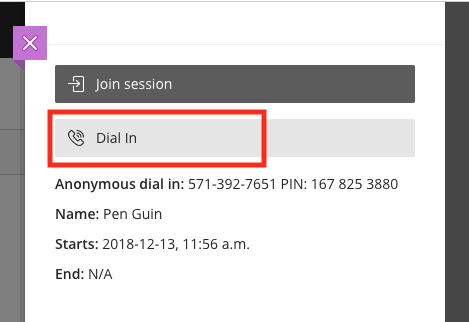 When you go into your course, you will see a section on the Course Navigation called ‘Bb Collaborate‘ (if you can’t find this section, ask instructor if they have enabled it in course navigation). 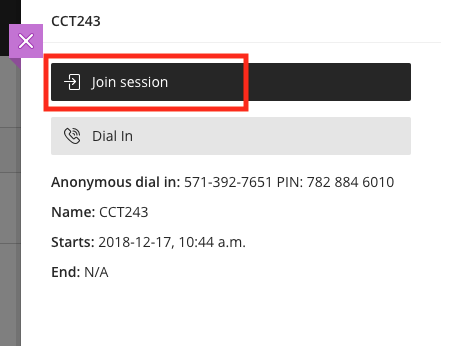 Click on that and it will bring you to a page with the session(s), and select the one your Instructor/TA wants you to join. On the side a panel will appear where you can join the session. Once you join the session you will see the classroom. There is an arrow on the top left corner that brings out a menu that you can use if you are having issues or if you need help. It’s also where students can leave the session by clicking Leave Session placed at the bottom. On the right side, there is an arrow at the bottom right corner. It opens up the chat and other options such as viewing others in the session, sharing content and settings. Once you enter the session, there are 4 important icons you should know. You will see these 4 icons at the bottom middle of the screen as shown below. These symbols are not too hard to understand. The two middle icons are the most commonly known icons. There’s the Audio and the Video. You are able to turn on or off your mic to talk if you are participating in the session. You can have your video on if needed using these buttons. 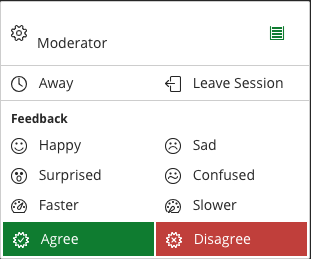 The last button in the row is the Raise Hand, when you click this icon the Instructor or whoever’s “Moderator” of the session will know that you have a question and will let you speak. The first icon in the row is the My Status and Settings. It lets you monitor your internet connectivity and give a status, such as if you step out of the meeting you can indicate that to the rest of the people in the meeting. For more information look at Get Started with Collaborate Ultra for Participants. Blackboard Collaborate is a great tool that your instructor and TA(s) may use and it’s best to understand how to use it before you have to use it. 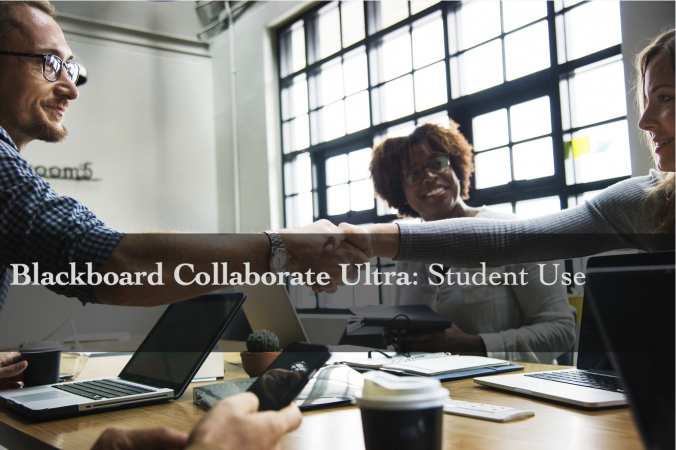 Visit the Blackboard Collaborate Ultra help site for students for more information.